Butch and friends at WSU Homecoming festivities. Celebrate the Cougar Homecoming football game at Kickoff at the CUB starting at 4:45 p.m. Saturday, Oct. 21, in the M. G. Carey Senior Ballroom on the second floor of the Compton Union Building. 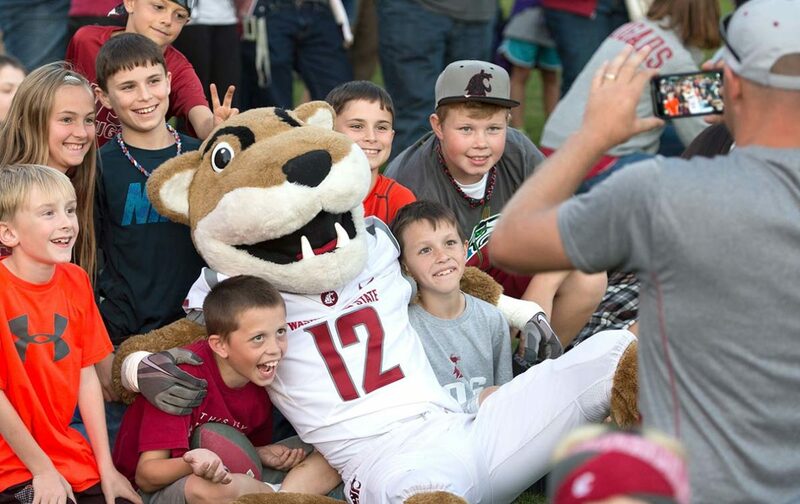 Spend quality time with your Cougar family before the game and take advantage of affordable food options, including Cougar Smokie Sausage, Cougar Gold mac and cheese, turkey and brisket sandwiches, hamburgers and more. All items are available for purchase through WSU Catering. Beverages for all ages are also available, with beer and wine provided by Southfork Public House. Kickoff at the CUB offers family-fun entertainment, games, and giveaways. The football game will also be shown on the CUB Lair big screen on the first floor. Game starts at 7:45 p.m.. Kickoff at the CUB events are held during every home football game. For more information, visit https://cub.wsu.edu/entertainment/kickoff/.